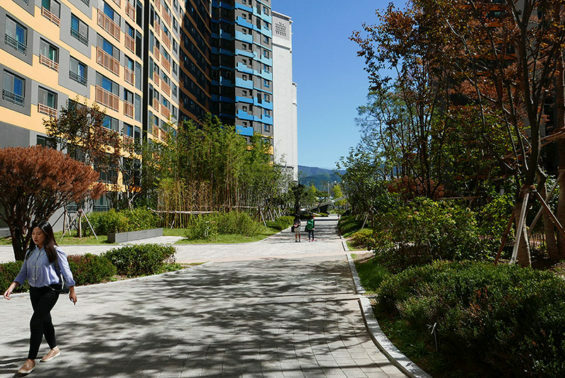 In Daegu, the third largest city of South Korea, a lush and green landscape is created for the residents of the 1,300 apartments (first phase). The site is publicly accessible, but Korean culture is such that it is mainly used by residents. The landscape design combines the secure atmosphere of a secluded landscape and the liveliness that the integrated sports, play and recreation facilities offer. 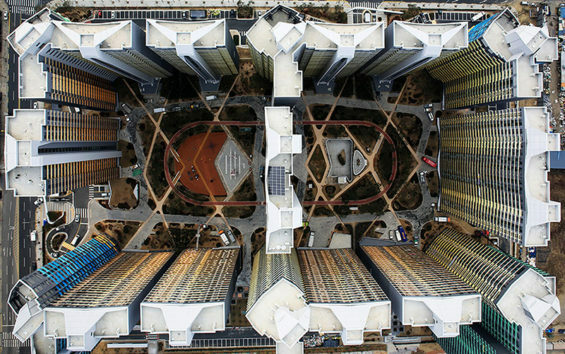 Daegu is a growing city with milder climatic conditions than Seoul. 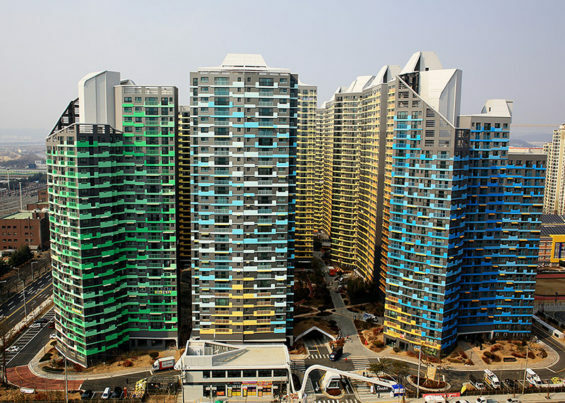 The rapid urbanisation and the limited non-mountainous area in South Korea results in dense multi-storey apartment complexes. This project for instance has a floor to area ratio of 280%. The apartments are serviced with a broad pallet of community facilities: library, nursery, senior citizen centre, community centre and communal sports and fitness facilities. 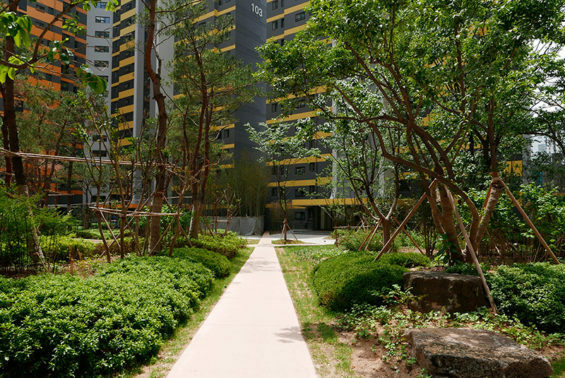 These facilities have a relationship with the landscape, through the location on the ground floor or connected through a ‘sunken garden’ when situated on the underground parking level. The landscape is technically a roof garden. It is made on a double storey car park, covering the full extent of the site. 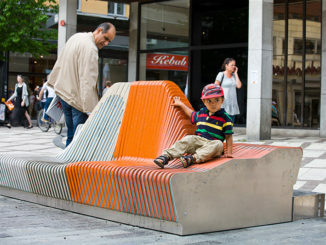 This results in a car-free landscape, that only incidentally needs to be accessed by moving trucks garbage collection. The structure of the parking basement allows for the planting of mature trees throughout the site, and this opportunity is fully utilized. The architecture, designed by UNStudio, is noticeable for the expressive colour scheme. The design language and colour scheme of the facades and the landscape design are in tune. The design is inspired by pleats in fashion, being an import industry in Daegu, and translated into a communal design language for facade patterns and forms in the landscape. Converging and diverging forms unify the spaces within the landscape, both horizontally and vertically. The pattern creates long lines of sight diagonally through the landscape. The folded topography, generating conditions for play in the forest playground, is illustrative for the possibilities that the pleads offer in the landscape. The facades have colour gradients that are echoed in the landscape: in planting and in paving. 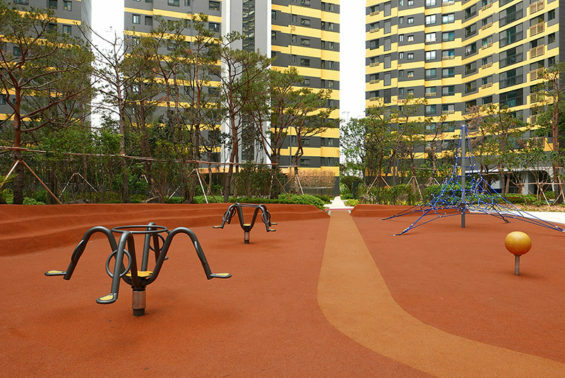 For example: the playground with the folded edges is made out of a rusty red and orange rubber, matching the dominant of the colours that make op the facades on the inside of the super block. 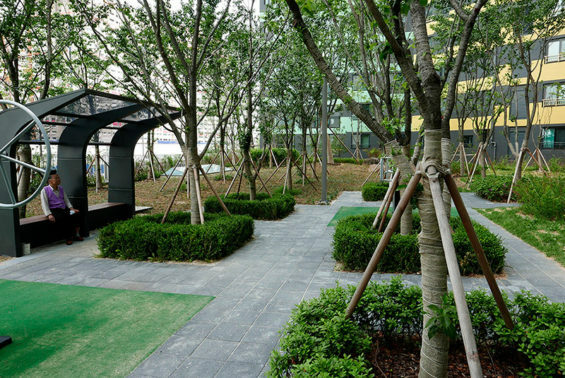 Inside the block is are central open spaces with facilities for play and stay. 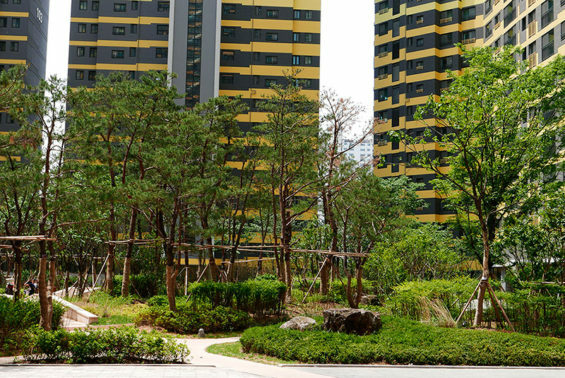 On the outside a series of gardens have specific program, such as fitness and games. In the centre of the block dense plantings of a variety of deciduous and evergreen trees and shrubs create a rich, forest like atmosphere: a nature retreat. The pines provide year-round shelter. 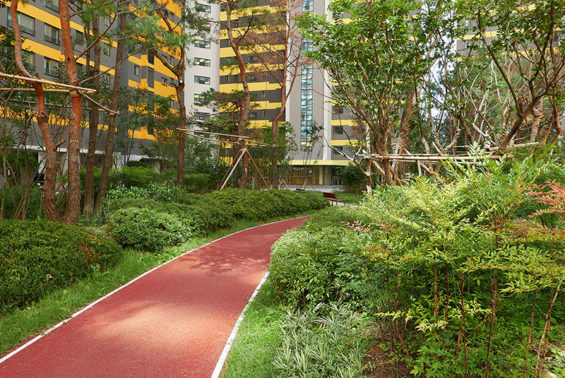 An extensive network of paths and jogging trails, linking all the apartment buildings, allow for a range of different walks or runs to be experienced. The running track is loved by the residents and not used by joggers only. The vegetation has a rich build-up of different layers. Under the tree layer there are several planting layers offering scale, colour and texture in the landscape. 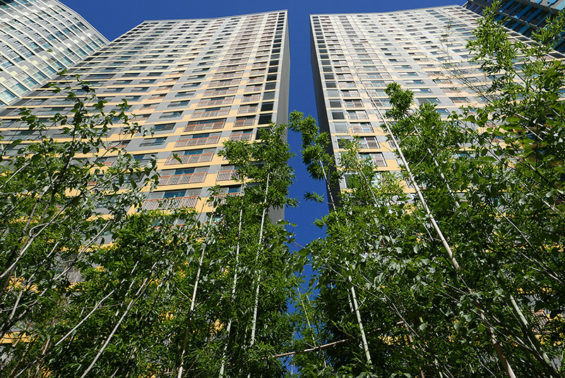 Right around the residential buildings high bamboos create exciting passages. What a lovely and fantastic landscape – it puts what we do in the UK to shame. I would be interested in knowing more about how the management and maintenance is funded (via rents or local taxes, for example)? 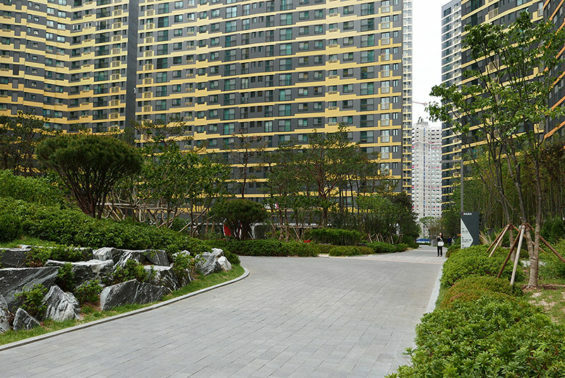 However, I urge developers and planners in the UK not to copy the development which surrounds the gardens – even without the Korean culture which means that these gardens will mainly be used by the residents, I would have thought that the urban design would have discouraged permeability and ‘outsiders’ passing through anyway.